Bulk Storage racks, made from of pallet rack and other roll formed metals, can hold light weight materials, or be designed to support heavy duty weight capacities. 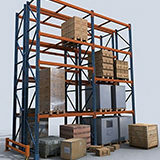 Storage racks allow for wide span and bulk storage applications. Used bulk storage racks is a great way to take advantage of these features, as well as the finacial benefits of purchasing used materials.